LM 3915 is the popular Monolithic display IC that gives the LED indications in a Logarithmic fashion. It has 10 outputs which are “current sinking”. That means, the LED connected to its output lights only when the output turns off. So at power on, all the outputs remains high. When its input gets 125 mV as signal, the first output (Pin 18) turns low and the LED connected to it lights. So in this way, for each increment of 125 mV, the outputs from 18 sinks current in a descending order. Since the input (Pin 5) of IC requires only very low input voltage, a Preset or Pot is a must to control the voltage. The LEDs do not needs current limiting resistors, since the IC itself control the LED current though the resistor connected to its pin 7. Assemble the circuit on a common PCB. Fix it near the battery to which the panel is connected. 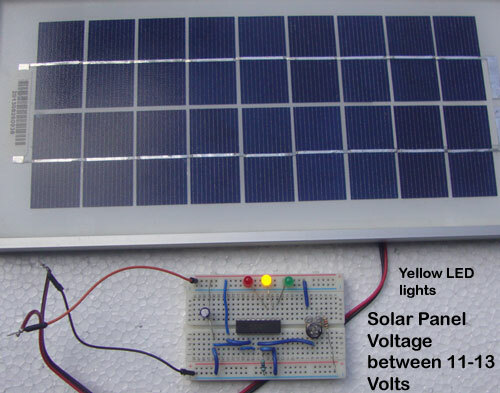 See image, the Diode is a must to prevent the backward flow of Battery voltage to the Solar panel as well as the circuit. 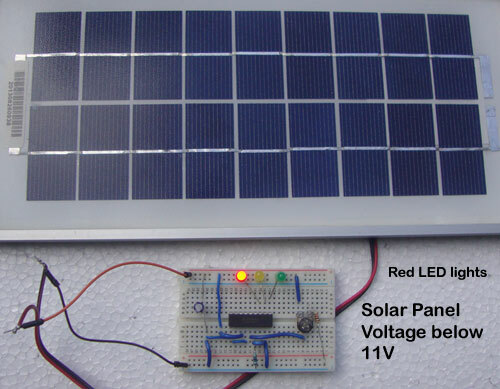 So the LED lights only when the Solar panel outputs voltage. 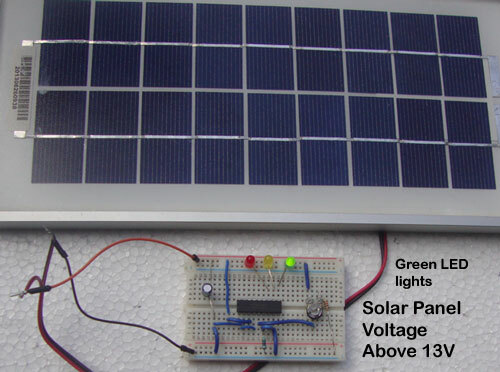 Connect the LED Meter to the outputs of Solar panel. Place the panel in bright Sunlight. Adjust Preset till Green LED lights. When the voltage drops below 13V, Green LED turns off and the Yellow LED lights. When the voltage drops below 11 V, Yellow LED turns off and Red LED lights. To get more info about LM 3915, LM3914 and LM 3916 IC, see the link.